The seven bowls of God's wrath come from seven angels, who come from the tabernacle of testimony in heaven. This is the place of two important things. One, the mercy seat that the blood of Jesus was applied to in heaven which would not be covering those on earth during this time as they all will have heard the Gospel and rejected it. People will have taken the mark of the beast and worshiped his image or have been killed. Secondly, inside the Ark of the Covenant, would be the Law. These seven angels are coming to deliver seven plagues and seven bowls of the wrath of God." The Seven Bowls of God's Wrath, with commentary. Seven angels come from "the tabernacle of the testimony" of heaven, the location of the Ark of the Covenant & Mercy Seat (in the earthly Jewish temple, this would be the Most Holy Place, inside the Ark would be the Torah (The Law) and upon the top of it, is the Mercy Seat where the blood would be applied). These seven angels have seven plagues to dispense and no one can enter the temple until these plagues are finished. One of the four living creatures gives them their bowls full of the wrath of God. They have the plagues and bowls of the wrath of God. Revelation 15:5-8 "After these things I looked, and behold, the temple of the tabernacle of the testimony in heaven was opened. And out of the temple came the seven angels having the seven plagues, clothed in pure bright linen, and having their chests girded with golden bands. Then one of the four living creatures gave to the seven angels seven golden bowls full of the wrath of God who lives forever and ever. The temple was filled with smoke from the glory of God and from His power, and no one was able to enter the temple till the seven plagues of the seven angels were completed." The people who will be receiving God's wrath will have rejected God's mercy sent through His Son, Jesus Christ, and will have chosen the evil one. They will have no covering as per their choices and will have to face the judgment and wrath of their choices. Bowl 1 / Revelation 16:2 "So the first went and poured out his bowl upon the earth, and a foul and loathsome sore came upon the men who had the mark of the beast and those who worshiped his image." 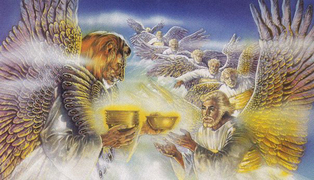 The 1st angel will pour his bowl upon the earth. All who will have received the mark of the beast & those who will have worshiped his image, will receive foul & loathsome sores. Bowl 2 / Revelation 16:3 "Then the second angel poured out his bowl on the sea, and it became blood as of a dead man; and every living creature in the sea died." The 2nd angel will pour his bowl upon the sea became as of a dead man's blood (coagulated) & every living creature in the sea will die. The Amplified Version says: "... the sea, and it turned into blood like that of a corpse [thick, corrupt, ill-smelling, and disgusting], and every living thing that was in the sea perished." Bowl 3 / Revelation 16: 4-6 "Then the third angel poured out his bowl﻿ on the rivers and springs of water, and they became blood. And I heard the angel of the waters saying: "You are righteous, O Lord, the One who is and who was and who is to be, because You have judged these things. For they have shed the blood of saints and prophets, and You have given them blood to drink. For it is their just due." The 3rd angel will pour his bowl upon the rivers and springs and turn them into blood. The angels declare it is their just due for killing the saints and prophets. Retribution. Bowl 4 / Revelation 16:8-9 "Then the fourth angel poured out his bowl on the sun, and power was given to him to scorch men with fire. And men were scorched with great heat, and they blasphemed the name of God who has power over these plagues; and they did not repent and give Him glory." The 4th angel will pour his bowl on the sun and mankind literally gets scorched with tremendous heat. Also, this is confirmation, the day of salvation is over; they only blaspheme God now. No one gets saved without being chosen and led by the Holy Spirit and the day of salvation has past. Bowl 5 / Revelation 16:10-11 "Then the fifth angel poured out his bowl on the throne of the beast, and his kingdom became full of darkness; and they gnawed their tongues because of the pain. They blasphemed the God of heaven because of their pains and their sores, and did not repent of their deeds." The 5th angel will pour his bowl on throne of the beast and his kingdom will become full of darkness. People will gnaw their tongues in pain and they will blaspheme God and still not repent. Bowl 6 / Revelation 16:12 "Then the sixth angel poured out his bowl on the great river Euphrates, and its water was dried up, so that the way of the kings from the east might be prepared." The 6th angel will pour his bowl on Euphrates River and it will be drying up, making the way for the kings of the East' preparations. Revelation 16:13-16 "And I saw three unclean spirits like frogs coming out of the mouth of the dragon, out of the mouth of the beast, and out of the mouth of the false prophet. For they are spirits of demons, performing signs, which go out to the kings of the earth and of the whole world, to gather them to the battle of that great day of God Almighty. "Behold, I am coming as a thief. Blessed is he who watches, and keeps his garments, lest he walk naked and they see his shame." And they gathered them together to the place called in Hebrew, Armageddon." Bowl 7 / Revelation 16:17 "Then the seventh angel poured out his bowl into the air, and a loud voice came out of the temple of heaven, from the throne, saying, "It is done!" Revelation 17:18-21 And there were noises and thunderings and lightnings; and there was a great earthquake, such a mighty and great earthquake as had not occurred since men were on the earth. Now the great city was divided into three parts, and the cities of the nations fell. And great Babylon was remembered before God, to give her the cup of the wine of the fierceness of His wrath. Then every island fled away, and the mountains were not found. And great hail from heaven fell upon men, each hailstone about the weight of a talent. Men blasphemed God because of the plague of the hail, since that plague was exceedingly great." In this last section of Scripture, when John writes "It is done!" - It really is done. But I believe John was not done. He starts in verse 18, describing some about the demise of Babylon. This is another "interruption or break" in some sense. Other men besides John put chapter and verse markings that seemed right to them. We need discernment to follow John, please consider it and see what holds out to make sense and come together. If all the bowls are done and a voice from heaven declares "It is done" then it is done. But the verses about the demise of Babylon have to apply to an earlier time. Babylon has to be destroyed at or near the rapture because the a voice from heaven says, "Come out of her, my people, lest you share in her sins, and lest you receive of her plagues. For her sins have reached to heaven, and God has remembered her iniquities." (Revelation 18:4b-5). "My people" have to be Christians (perhaps from interment camps) or some of the 144,000 Jews that will be sealed at that time too. But there should be no people of God in Babylon after the rapture and the sealing of the 144,000. Revelation 19:11-13 "Now I saw heaven opened, and behold, a white horse. And He who sat on him was called Faithful and True, and in righteousness He judges and makes war. His eyes were like a flame of fire, and on His head were many crowns. He had a name written that no one knew except Himself. He was clothed with a robe dipped in blood, and His name is called The Word of God." Revelation 19:14-16 "And the armies in heaven, clothed in fine linen, white and clean, followed Him on white horses. Now out of His mouth goes a sharp sword, that with it He should strike the nations. And He Himself will rule them with a rod of iron. He Himself treads the winepress of the fierceness and wrath of Almighty God. And He has on His robe and on His thigh a name written: KING OF KINGS AND LORD OF LORDS." Revelation 19:17-18 "Then I saw an angel standing in the sun; and he cried with a loud voice, saying to all the birds that fly in the midst of heaven, "Come and gather together for the supper of the great God, that you may eat the flesh of kings, the flesh of captains, the flesh of mighty men, the flesh of horses and of those who sit on them, and the flesh of all people, free and slave, both small and great." Revelation 19:19-21 "And I saw the beast, the kings of the earth, and their armies, gathered together to make war against Him who sat on the horse and against His army. Then the beast was captured, and with him the false prophet who worked signs in his presence, by which he deceived those who received the mark of the beast and those who worshiped his image. These two were cast alive into the lake of fire burning with brimstone. And the rest were killed with the sword which proceeded from the mouth of Him who sat on the horse. And all the birds were filled with their flesh." This is very real and very serious. The time to be saved is today. The time to see loved ones saved is today. Not only will a person need to be saved to make it through the intense tribulation that happens during the first three and one half years before the rapture, but a person will need to know their Bible in order to recognize all the deception that will be rampant. All believers will need to be close to the Lord to have the strength to endure. How many times, does the Bible say beware of false teachers and prophets? The only way to recognize them is by knowing the truth of God's Word for oneself. To the writer of this article, this is the end of 6000 years of mankind living in a fallen world. In the very next verse, which happens to be in another chapter (Revelation 20:1), Satan himself, is bound and cast into a pit thousand years. There are still 1000 years of millennial reign of Christ to come on a recovered earth and then Satan will be released for a season of testing for those born during that time. But when his short season is over, its over. He will be put away forever. Did I say forever? Yes, forever! And there will be a new heaven and a new earth (old universe and earth destroyed) and sin will be no more. No more fallen natures to deal with and no more devil or demons. A clean and wonderful eternity with our wonderful God and we to be His joy as His people. Now this is a happy ending (and beginning). OTHER ARTICLES PERTAINING TO THE "SEVENS OF REVELATION"
The seven seals listed with commentary and also showing correlation with other Scripture. There are seven trumpets of God reserved for the wicked. The "last 3 trumpets" are also called the "3 woes" and it is shown here in Scripture. John experienced an angelic visit while writing about the seven trumpets. A side by side view of the 7 trumpets and 7 bowls for the person seriously studying the book of Revelation. Listed for the person wondering how many "sevens" there are in the book of Revelation. How we know there will be a rapture and more. Understanding "harpázō" - the word from which we get the term "rapture" that we use today. Article showing various end time and rapture views including millennial views with definitions to help in having a deeper understanding. From this prophecy in Daniel, "the last week of years" are determined, which are commonly known as "the 7 years of tribulation" and this article includes a chart to help in understanding. Understanding that mid tribulation rapture is pre-God's wrath. Taking a closer look at what "wrath and tribulation" really mean and what really happens during the last 7 years of this age. A word study, taking a deeper look at original context. The best biblical mindset for living in the last days, as shown in 1 & 2 Thessalonians. Copyright 2014 E. Cockrell May be used for personal study or instruction but shall not be copied and/or distributed in whole or part without permission or for financial profit.